Sydney, the most livable city I've ever seen, is full of breathtaking running routes. Water and hills, sailboats and secluded coves are everywhere. Here is one of my favorite corners of Sydney, the South Head area, at the mouth of Sydney Harbour bay. The rocky peninsula is sometimes just a hundred meters across, lodged between the peaceful harbor to the west and the wild Pacific coast to the east. 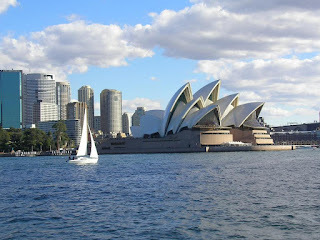 But if you're going to travel to the south head, then you should do it right: no bus or car, but take the ferry, the most stunning way to move about on Sydney Harbour. For this route, we'll take the ferry from the downtown Circular Quay to my favorite cove, Watson's Bay. The ferry ride alone will make your day. As the ferry glides into the bay, with the boats moored in front of the beach, and Robertson Park stretching up the hill, you'll just want to stay right there. In fact, you should bring a change of clothes so that when you finish the run you can eat at one of the spots here at the beach. If you are there in the morning, you can brunch on some eggs benedict at one of the two cafés on the south edge of the park: look for the yellow houses. When you get off the ferry, just turn left and run north (houses on the right), right up the short beach. Just as the beach ends, take the footpath up to the street and then turn left on Pacific Street at the first intersection in this pleasant neighborhood. Follow Pacific the short way to Green Point Reserve, a small rocky outcrop with a great view of the harbor. 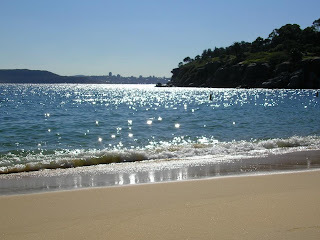 Then run down to the next beach, Camp Cove, which is a great place to jump in the water. Run north along Camp Cove (houses on the right). and you'll see the walkway going up into the trees, with one part branching over onto the little shack on the rock out in the water. Follow the path up the hill above the cliffs. The military base will stretch along your right side. The cliffs are impressive, and there are lots of great vistas. At one spot, a path leads down to a secluded nudist beach. The military base soon ends and you find yourself in the parkland of South Head itself. 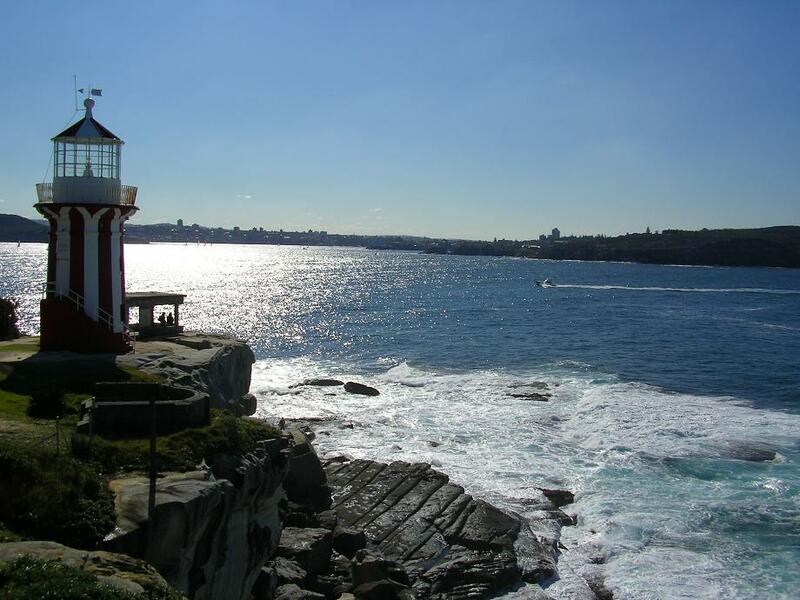 This narrow point of land looks out at the harbor, at North Head, across the harbor mouth, and to the Pacific. The waves below are impressive. There is also a lighthouse here, and old defensive-gun emplacements. Unfortunately, the military base blocks access to go southward on the Pacific side, so you have to run back the same way you came. So head back to Camp Cove beach, but this time, just before the beach, stay on the path as it cuts westwards along the south end of the military base, with the houses to the right side. After a few minutes, you'll find yourself back at the wild Pacific cliffs, running south. Now, you just keep running southwards along the cliffs, parallel to Old South Head Road. Within a kilometer you will first pass an old lighthouse, then a newer, free-standing one, with a blue base. We'll keep running south through the big open lawn south of the light house. Just as you approach the houses at the south end of the park, turn right and head back inland to the road. 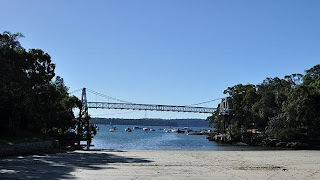 We could now go to several beautiful coves and beaches on the harbor-side: Shark Beach, Vaucluse Bay and Parsley Bay, but the roads getting there are a bit windy and hard to follow. So we'll skip Shark and Vaucluse, and just catch Parsley Bay on our way back to Watson's Bay. 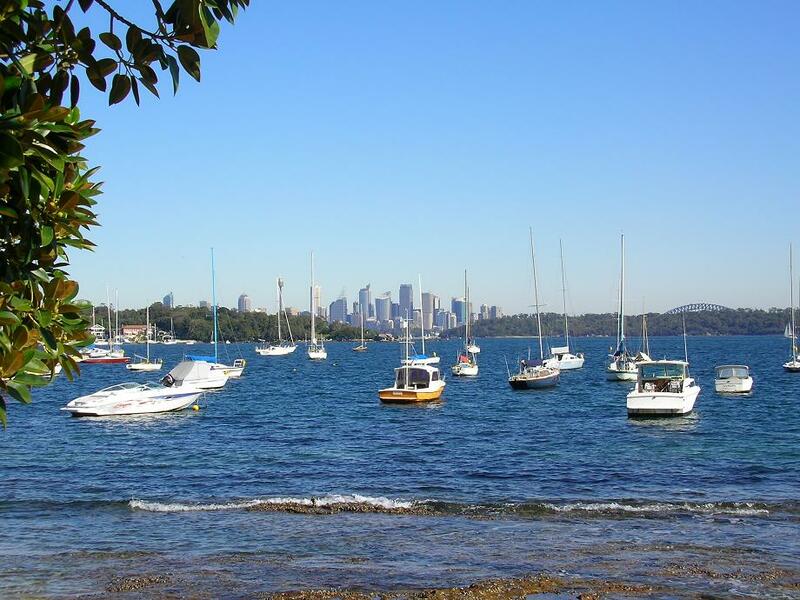 Parsley Bay is cool enough itself, and there was never a more hidden-away jewel than this. When you get back to South Head Road at the edge of the lawn, you'll face a roundabout. Take New South Head Road, leading diagonally off to the left. Just run 200 meters and then turn right on Serpentine Parade. Follow the street downhill, and in just 200 meters it runs into Hopetoun Avenue, where you turn right. After another 100 meters, turn left on Fitzwilliam Road and follow it along as it curves to the right. Look for the side street on the right called Parsley Road and follow it in through this very cool, jungly neighborhood until the sharp left turn on Horler Avenue takes you up over the hill and right into the wooded park at the bay. When you come out at the beach, you'll be amazed at the suspension footbridge spanning this tiny cove. Keep on the right side of the beach and run towards the bridge. There is a wooden boardwalk along the waterside, below the stone cliffs. There are some steps leading down into the water near the shark barrier, where the boats are moored. At the mouth of the cove you can go up the path to the top of the cliff and continue running along The Crescent. It runs into Hopetoun Avenue again, where you turn left and run just 100 meters before you have the chance to head to the water again, on Palmerston Street (turn left). The street ends and you follow the footpath down to the water. 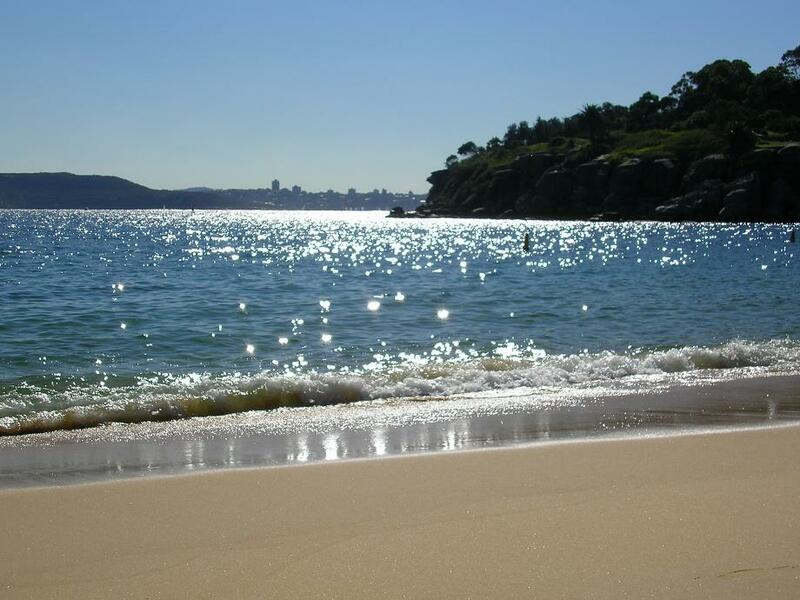 Now, at the beach, you just turn right and run the few hundred meters back to Watson's Bay, passing the cafés along the way. Now those eggs benedict will really hit the spot! Sydney is indeed a very lively city where everything comes to live even at night. Life there is also very accessible so I am always on just my bicycle to stay mobile. It is a healthy form of transport which is a cheaper alternative too. I travel to and from home and my self storage easily and being environmentally-friendly at the same time.